This is not a board game, but more like a video game. But it looks so fun, that I wanted to add it to the list. 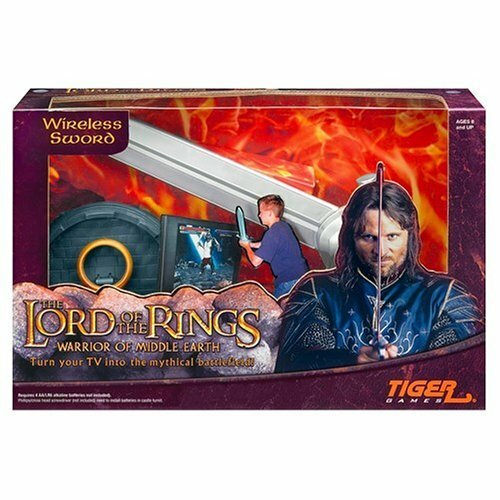 You get a sword with a wireless remote (RF remote I think) that moves a sword on the screen, like a video game. From some of the reviews that I have read, it can get quite tiring, in a fun way, swinging the sword around fighting off evil in Middle Earth. I wanted to get this game for Christmas, but alas, I did not get it. I think I will still go out and find it. Toys R Us on-line carries it for around $45 or $50. I've seen it upwards of $60 on ebay. As usual, more later. Turn your TV into the Epic Battlefield. Journey through Middle-earth, defeat evil creatures and learn new sword moves along the way. Complete one stage and then move on to the next stage. Finish your quest by defeating Sauron himself. bar goes to zero your game is over. Your power decreases as enemies that you fight hit you for damage. As you advance through the game, special new sword powers will be given to you. and Command of the Dead. fighting bats and crows. This basic combat teaches you how to swing at enemies and block their attacks. At each stage the map shows the progress of the company. The game follows the movie story line. Graphics are based on what was seen in the movies (i.e. what an Orc, Cave Troll, or Sauron looks like.). Graphics and movement are basic at best. Do not expect Xbox/Gamecube level of visually graphic beauty. 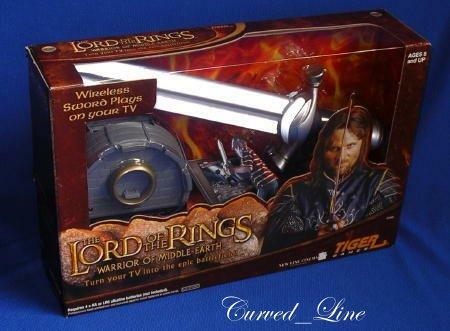 sojourn into Middle Earth, could not write for any length of time because her sword arm would cramp up. What a weenie! The game is rated for ages 8+, but my two children being 7 years old and 4 years old love it. They also picked up the game rather fast and do quite well. I think overall it is a good basic game. Middle Earth is a must for any Tolkien fan.